Stacy from Louisville: Thanks for a great first week!!! I think it was the movies of the late 80s and early 90s that ruined me for romance. To this day I'm still waiting for Mr. Idealistic in a trench coat to hold a blaring boom box outside my bedroom window, proclaiming his undying affection. I realize this is asking a bit much, but there are some days I’d settle for a poncho and a clock radio. (The light, the heat…I am complete) But I digress. As you probably know I've been leaving obnoxious comments on SCL for awhile. Now blogging on my own I've had over 450 of you read my little ramblings in the past 4 days. That has been awesome and I thank you for giving me a chance, and I hope you'll stick around. Your comments are fantastic and I look forward to building up a little community. Again, thank you. Of all of you who have visited there is one person whose comment completely lit me up inside. It's my husband, Dan. As I have said before, Dan is very cut and dry. He's not the romantic type, or at least not in the traditional sense. In fact, when he asked me to marry him he gave me a Hulk Hogan doll. What woman could resist that? The other night we were falling asleep. The house was quiet. I thought the talking was done for the day. But out of nowhere, he said the most romantic words a female sanguine could possibly ever hear: "I think you're pretty funny." Just like that and then he rolled over, pulled up his blanket and went to sleep. Come to find out he's my biggest fan. Nobody loves me like my husband. I forget that more often than I should. Don't know why I would automatically assume he's anything less than exactly what God designed for me. When it comes to brass tacks, I know I've definitely married up. So thanks again for reading! Next week we'll tackle Bible college, or "It's Not Too Late To Enroll Somewhere Else". I'll keep bringing the ranting and raving if you keep reading!! Stacy, I am proud of you. And for those that care I read this one on my own, no phone call yet saying "listen to what I just wrote"
Now what's for dinner? Have you ironed my clothes yet? Both kids better have had baths by the time I get home! Get to work woman! Looks like hubby might be a little bit funny too. I love it, Stacy. I'm glad you started this blog. 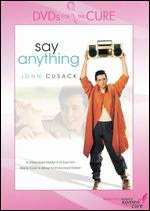 And what girl hasn't loved John Cusack in her lifetime?? Stacy nice job :) I enjoy it. You sound like me in real life. I am wonderfully sarcastic in person however in "comments" of specialness I come of sounding corny and a little crazy. I think stacy from louisville just got her own stacy from louisville! Hey Stacy...I've been reading you all week...ever since you got "outed" on Jon's blog. And I am enjoying every moment. So now I have another blog to check every day! Just like last night, only reheated. I await Bible college stories with bated breath. Looks like I have a lot of catching up to do. I haven't been able to read my blogs like usual lately. I can't imagine what I've got to catch up on SCL. Sigh - so many blogs, so little time. Hey could you please leave the recipe for CRAP?! It sounds delicious! Is CRAP...Canadian Ratatouille And Parmesan??? Your Dan is sweet. MY husband actually teases me about my long term blog. Then again, it's an "I don't really care" kind of teasing. He's couldn't care less. How sad, because I DO have fans. A fan. People I pay. The STUPID thingy won't take my name. It's JennyM here. FYI: you have male readers, too. I noticed most of the comments on here are from females. just letting you know you have fans like me who are guys and who think you are utterly hilarious. I spent one year at Boyce/southern seminary so I can't wait to here your thoughts on Bible college. There must be more to the Hulk Hogan doll. Details, woman! I called the music station my hubby was interning at when we were in college and asked them to play "In Your Eyes" for him. They were a country station, and they played it! I had that movie soundtrack, and I either wore it out or the tape melted. Can't remember which. This is an awesome post! My husband is the funniest person I know, so it always makes me happier than I can ever explain when I am able to make him laugh. I always feel like his jokes are better than mine, you know? So, I totally get this post! BTW, I love reading your comments on SCL. And your Bible college posts are fantastic. I attended, not one, but two Christian colleges, so I relate to those posts, too.